A mother’s faith, a child’s courage, a doctor’s dedication—a moving and thought-provoking tale of hope, love, and family He might be young, but Colm already recognizes the truth: that he’s sick and not getting better. His mother, Cathleen, fiercely believes her faith will protect her ailing son, but Colm is not so sure. With a wisdom far beyond his years, Colm has come to terms with his probable fate, but he does have one special wish. He wants to meet his father who abandoned his beloved mother before Colm was born. But the quest to find the dying boy’s missing parent soon becomes a powerful journey of emotional discovery—a test of belief and an anxious search for proof of heaven. A magnificent debut novel, Mary Curran Hackett’s Proof of Heaven is a beautiful and unforgettable exploration of the power of love and the monumental questions of life, death, and the afterlife. 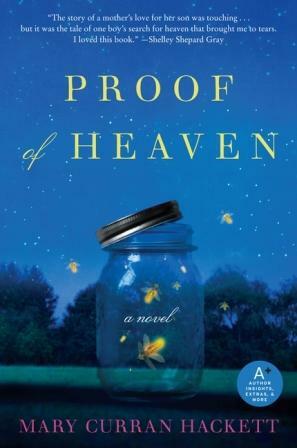 Proof of Heaven is a thought-provoking read for those who believe and those who sometimes question what comes next. Cathleen is a single mother willing to do any and everything to save her very sick child, Colm, who has "died" many times. We follow all the characters as they struggle with questions regarding their faith; it hasn't been a easy road. Biblical symbols can be seen in the characters throughout the book. The message is clear and heart-warming. Starting off this book quickly caught my attention, and I connected with the story right away. I loved Colm and felt his courage and strength. Though his mother irritated me, I felt her actions were understandable and believable. Also, the writing was amazing. I felt like each word was placed for a specific purpose and it made me think long after I had finished a page or a chapter. It was an easy read but the story-telling wasn't straight forward, which was quite refreshing. The pacing dragged a bit in the middle but toward the end, I was ripping through the pages looking for the end. As a story, I enjoyed it. As for the message, I was a little disappointed with the ending. I felt it went from being extremely realistic and easy to connect with to being...well dramatic and "sweeping." Overall, I really enjoyed it. I would recommend this to those who are in need of a inspirational read. Though the message seems to be universal, I think believers will likely get more out of it. Thank you! I really enjoyed it a lot. I'm not sure if it is heavy-handed or not. It's different. I think it is more inspirational than anything. I haven't read tons of Christian Fiction but this one is different from those that I have read. This story and these characters could be real. If you decide to get to know Colm, you won't be disappointed. Of course!! I'd be honored. Oh it was a great read. The end was disappointing for me personally but I think many will like it. I really just didn't feel like it fit the rest of the book. Oh I agree. I'm certainly glad I put that in. I think you will enjoy this one for sure. I love your review. Can I feature and link it to our first Sunday book review for December? This would be perfect. I'm glad that you enjoyed it even if you weren't in love with the ending. Thanks for being on the tour! I like the sound of this, and I don't mind Christian Fiction as long as it's not heavy handed! Haven't read Christian Fiction but this one has me intrigued. I love the cover and your review makes me want to give it a try. I do love inspirational books, and they seem hard to come by. Colm sounds like an excellent character I'd like to get to know. Your excellent review reminds me of why I love honest reviews. Sometimes what doesn't work for someone is exactly what makes me want to read a book. Your review has convinced me to add this to my TBR.